Sharks are amongst the oldest creatures still living on this earth. They are members of the group called Elasmobranchs (Sharks, Skates and Rays). Fossilized scales date sharks as far back as 420 million years ago to the Silurian Period. From the Devonian Period, 400 million years ago onward, the fossil record is more complete and varied with the first fossils of shark teeth occurring during the Devonian. 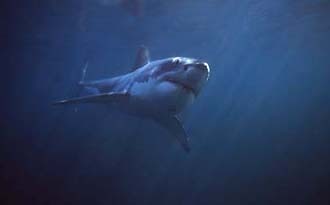 Nearly 3000 shark species have been described over time with about 465 species still in existence today. Compare that to the dinosaurs. Sharks were around 200 million years BEFORE the dinosaurs and there are only about 650 - 800 dinosaur species identified with none still alive today. During the Carboniferous Period, 360 - 286 million years ago, a large number of bizarre sharks appeared. Many had strange protrusions on their heads. These types of sharks are called Stethacanthids. One shark in particular called Stethacanthus, looked like a normal shark with the exception of having what looked like a bristle brush sticking out of its back. It is still a mystery to scientists as to why these fascinating creatures had this headgear. During the Carboniferous Period, a staggering 45 FAMILIES of sharks existed! This is considered to the be the "Golden Age" of sharks, where a huge variety of species emerged including many more bizarre types than ever in earth's history. A mass extinction during the Permian Period about 250 million years ago brought this wondrous era to an end killing off 99% of all marine species! The types that survived later gave rise to the modern sharks of today. From the mid-Miocene Period 16 million years ago to the Plio-Pleistocene Period 1.6 million years ago, the most notorious and fearsome of all sharks existed - C. megalodon. Believed to have exceeded 60 feet in length and weighing over 52 tons, this huge monster is the largest predatory marine creature that ever lived, second only to the Sperm Whale. Fossil teeth have been found that exceed 7 inches in length! Much has yet to be discovered about this giant killer including the reason for its extinction. During the early Jurassic Period, 190 million years ago, a variation of sharks appeared called Batoids. Batoids are basically flattened sharks and comprise all skates, rays, guitarfish and sawfish. Approximately half of all Elasmobranchs are found in this group. Whereas the torpedo-shaped sharks move through the water by the side-to-side motion of their caudal fin (tail), batoids move by a wave-like undulation of their pectoral fins, like wings flying through the water. Sawfish resemble slender-bodied flattened sharks but with a long, tooth-lined, chainsaw-like nose jutting out from their heads. Guitarfish resemble the same but without the bizarre snout of the sawfish. The ability to differentiate between skates and rays can appear to be difficult but is rather easy based on some obvious physical characteristics. On skates, each pelvic fin (small fin behind the main wings) is divided into two lobes compared to the single lobe of a ray. Also, rays have a stinging barb attached to their slender to whip-like tail yet, skates have a short, more stout tail with no stinging barb. Sharks are perfect yet, mysterious predators. To have survived for so long is a testament to the ideal nature of their design. In the advent of all the modern advances in science, very little is still understood about sharks.